The defense chiefs of South Korea and China held talks on Friday during which they agreed to set up more hotline between their air forces and promote military exchanges. 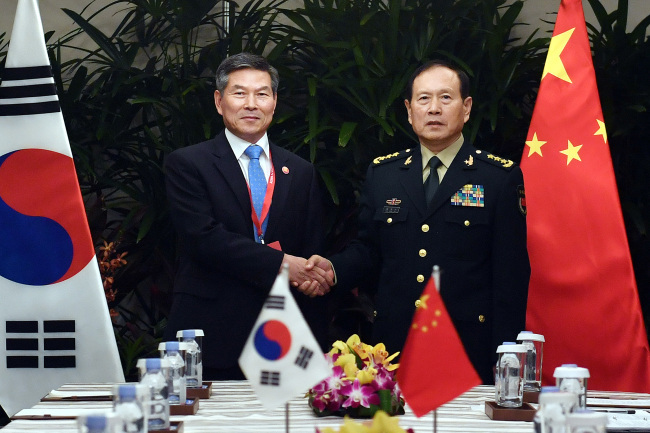 South Korean Defense Minister Jeong Kyeong-doo and his Chinese counterpart, Wei Fenghe, also agreed to jointly work toward peace and stability on the Northeast Asia, Seoul's defense ministry said in a statement. The talks between Jeong and Wei were held on the sidelines of the 5th ASEAN Defense Ministers' Meeting Plus in Singapore. In August, South Korea scrambled Air Force jets to counter a Chinese military plane flying in the country's air defense identification zone.